For most homeowners, a sewer line never crosses their mind until a replacement is necessary. It can start with a smell of sewage, wet patches in your yard or slowly draining toilets. The sooner you catch a problem with your sewer line, the easier the repair can be. Master Plumbing & Mechanical offers complete sewer replacement services, including video diagnosis and inspection. Before your sewer line reaches full-crisis levels, there are some warning signs to look for that can help you identify the problem early. Odor: A foul odor of raw sewage rising from your drains, including toilets, sinks, tubs and showers can be an indication that a sewage line is damaged. If all of your home’s drains are experiencing slow drainage, there may be more than a simple clog at work. A partially collapsed sewage line can result in slower draining for the entire home. Backflow: If water backs up into your tub, sink or shower when your washing machine drains out or when you flush the toilet, this can be an indication of a sewage line in need of replacement. A trees root system is designed to actively seek out sources of moisture. If a tree’s root system is located close enough to your sewer line, you can bet that the roots will eventually seek out the sewage line, breaking through weakened material and eventually growing inside the pipe to clog it completely. If you suspect a problem with your sewer line, we can perform a video inspection to locate and assess any problem areas. If the problem is a small clog from accumulating grease, or tree roots it may be treatable in a localized area. For older homes with sewage pipes made from outdated materials, the entire system may be breaking down in multiple locations. Patching small areas may probe more expensive over time than replacing the complete sewage line with PVC pipes, which can last for over 100 years when properly installed. Whether your sewage line needs complete replacement or a localized fix, you can rely on Master Plumbing & Mechanical for an accurate diagnosis, a fair quotation and details on our recommended course of action. Master Plumbing & Mechanical services the Washington, D.C. metropolitan area. 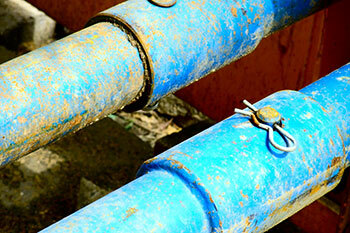 If you have concerns about the state of your sewage line, contact us for a consultation.